The Steel Interstate IS sound public policy! WHY? WE ARE ON THE CUSP OF A TRANSPORTATION CRISIS: Forecasts from many sources predict that demand for freight transportation in the U.S. will as much as double by 2040. Interstate Highway capacity is increasingly congested, especially in urban areas. 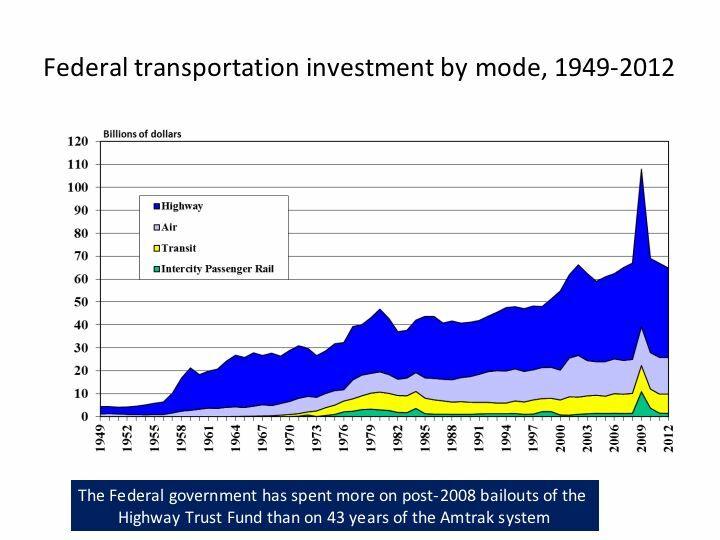 The Highway Trust Fund cannot afford new roads or lane expansions, with maintenance of existing roads and bridges consuming more money than the Trust generates. Road widening projects are also being increasingly viewed as environmentally unacceptable. Trucking companies face a chronic driver shortage, railroads in many areas are at or near capacity, and both modes are wedded to oil and its greenhouse gas emissions. How, then, can future freight growth be accommodated? SOLUTIONS! A HIGH-PERFORMANCE RAIL SYSTEM: Shifting to rail-based shipping and passenger transportation, powered by electricity from renewable sources, would significantly reduce our near-total dependence on oil and greatly reduce greenhouse-gas emissions. We could, if we act now, begin to add the sustainable infrastructure investment needed for new freight transport capacity, affordable mobility of people, and improved economic competitiveness and standard of living for decades to come. 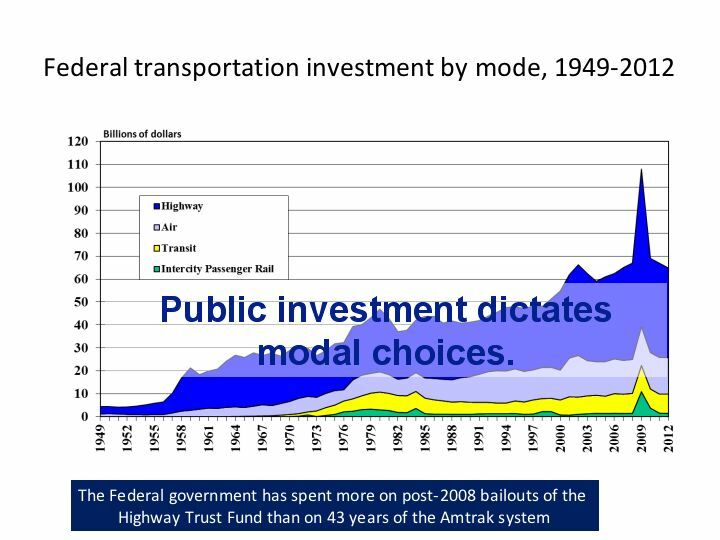 COST EFFECTIVE: Today a dollar invested in rail will buy more U.S. freight-carrying capacity than that same dollar spent on more highway lanes. To understand why, think of the Steel Interstate as analogous to Interstate Highways built over the last 50 years. The Interstate Highway System gave us a core national network of roads that made travel much faster and safer than on the old system of U.S. Highway routes. 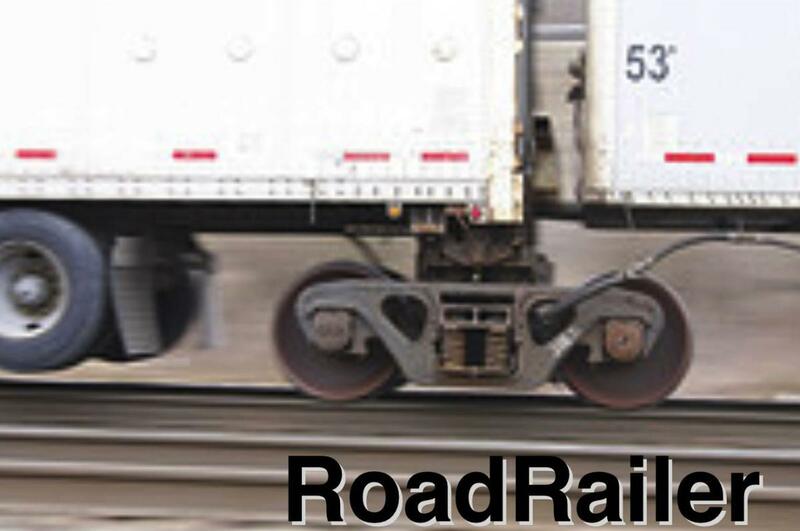 Today’s railroads similarly lack capacity to handle today’s growing freight and passenger demand. But they, too, can be rebuilt as a grade-separated, high-capacity, electrified national system of key rail corridors – a Steel Interstate. Using only a third of the fuel to move a ton-mile of freight that trucks use, railroads are far more energy efficient and less damaging to the air, water, and climate. Freight by rail is cheaper, cleaner, and could be faster. The Steel Interstate provides the capacity and speed to make this happen. Railroads can readily be electrified, so Steel Interstates can be powered by many energy sources. U.S. transportation is now totally dependent on oil, so even though oil is relatively cheap and abundant now, America is vulnerable to supply disruptions and price spikes. Electrified rail corridors could be powered by natural gas, oil, nuclear, coal, wind, solar, hydro and biomass. Rail corridors could also help transmit remote wind or solar power generation to urban markets. Sustainable infrastructure investments can provide a national Steel Interstate System of high-capacity, electrified rail lines that would be the backbone for fast, efficient, reliable movement of freight and passengers in 21st Century America. RAIL INVESTMENT OFFERS NUMEROUS TRANSPORTATION BENEFITS AND MORE: Besides passenger trains and conventional freight, a Steel Interstate would provide capacity to carry trucks aboard trains. Though U.S. railroads have done a great job developing long-haul intermodal business, it is focused almost entirely on double-stacked containers, handled through huge, regional terminals with added cost and delay. The nation needs a more versatile, flexible, “open” intermodal approach, a technology that can readily handle not only shipping containers, but all kinds of trucks and trailers for true highway-competitive rail service. The three photos above suggest more highway-competitive rail options that greater capacity and reliability will stimulate. Millions of trucks on the nation’s highways remain a huge untapped opportunity and challenge. 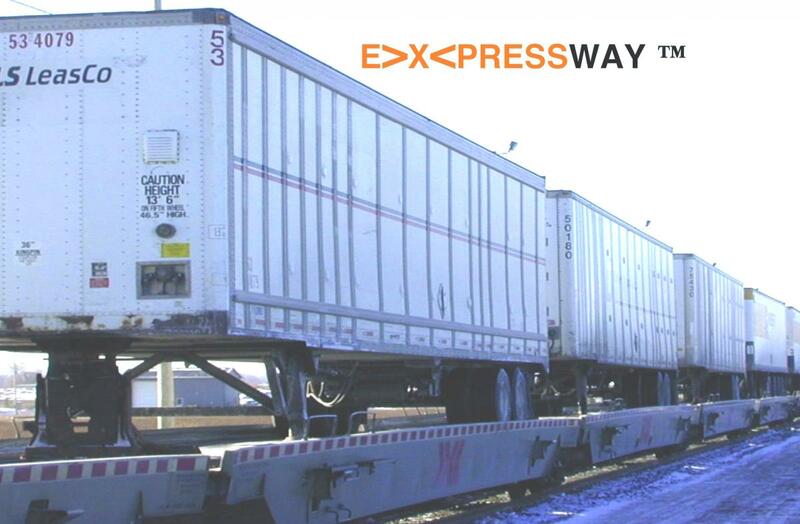 Currently, the U.S. railroad system lacks the capacity, reliability, and speed necessary for true highway-competitive handling of trucks. American railroads are chronically congested, and have no margin to handle new business. The Steel Interstate can fix this. Adding to the list of benefits are the decreases in CO2 emissions and truck traffic in metro areas means safer, healthier living and travel for everyone. Not to mention that every gallon of diesel not consumed means fewer barrels of oil imported into the United States. In 2014, despite reviving domestic oil production, the U.S. still imported 27% of the oil that it consumed (Energy Information Agency). Burning less imported oil helps our nation reduce its chronic balance of payments deficit. For a detailed assessment of even more benefits of the Steel Interstate, click here. The time has come to explore innovative public/private financing options for a Steel Interstate. RAIL Solution is working to form the North American Steel Interstate Coalition (NASIC) to promote this goal. Read more about NASIC here.